For those of us with AR type rifles or those with similar sights, this is a useful piece of kit. One of the issues with a tactical rifle can be the light mount. Should it be under, to one side, and where should the switch be mounted? How will it work when shooting over or beside a barricade? 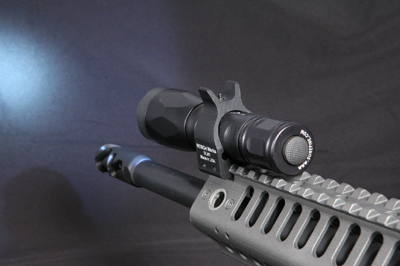 Roschworks' SLM1 avoids all this by mounting the light directly over the barrel, with an iron sight above it. The unit is milled from one piece of 7075T6 aluminum, and mounts solidly to a standard rail. The profile is just right for co-witnessing optics and iron sights, and the sight is solid and does not drift under fire. It adjusts easily with a dedicated tool, or a pair of fine pliers (in an emergency). With the light in this position, the target is fully illuminated inside the sight window, with no shadows or dark spots. It's very easy to activate by rolling the thumb up around the handguard, and that position fits perfectly with several modern stances and grip styles. Any standard 1" tube light should mount without issue, and it will take reflectors under 1.5" without interfering with sight pattern. 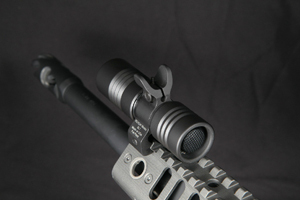 If you need to bottom the sight for long range zero, it may be necessary to choose a light with a flat on the tube - the post will protrude into the ring at bottom seat. This is a simple, reliable and trouble free piece of gear that can reduce the clutter on your modern tactical rifle. They also have a unitized item with the light permanently installed, producing 250 lumens from one CR123 battery. Roschworks products are made in the USA. NOTE: I purchased one of these from the company, and have bought other items before. I have no financial interest in them.